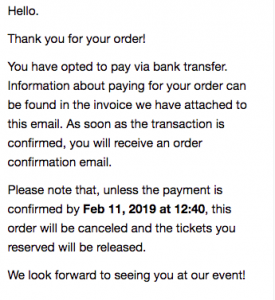 Can my clients buy tickets using the Bank Transfer payment option? This payment option can be activated from the Dashboard, under Billing you will find the Payment methods option. After you activate the option make sure your Billing settings are correct. 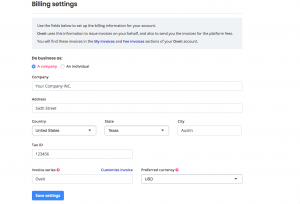 To help clients transfer money directly into your Bank Account go to Account settings/Invoice Customization and add your bank Account/IBAN on your invoice. You can also add this information in the follow-up email. Attendees register for an event and select Bank Transfer as a payment method. The system reserves the tickets, but does not sends them to the customer. Customers receive a follow-up email with more details about the order (and the expiration date). The email is 100% customizable, of course, so you can add your bank information here as well. In your account, the order will have the ‘Pending Payment” status. Once the money is wired to your account go the order, select “Order details” and change status to “Confirm payment”. The status will update to “Completed” and the customer will automatically receive an email with the e-tickets. Pretty simple, right? But please let us know if you need our help. Copyright © 2019 by Oveit Support.